Post by Matt Papuchis, Hospitality Vitae’s Disney Expert! People say to me quite often, doesn’t going to Disney as frequently as you do ever become stale? The short answer is no. Even if I did the same thing every time I visited the parks, it would not get old. No matter how many times you walk down Main Street, USA in Magic Kingdom and stand in awe as you see the majestic Cinderella Castle before you… or gaze at the Tree of Life at Animal Kingdom and marvel at its beauty, the feeling never changes or lessens in intensity. That said, the real reason it doesn’t get old is because there always is something new to discover and experience – even for those of us fortunate to visit often. Disney is known for continually adding new attractions, shows, restaurants, resort hotels, and even expansions to existing parks – such as Pandora in Animal Kingdom in 2017, Toy Story Land in Hollywood Studios in 2018 and of course the upcoming opening of Star Wars: Galaxy’s Edge later this year, also in Hollywood Studios. The number of new things coming between now and the 50th anniversary of Walt Disney World in 2021 are too numerous to name. Point is, no matter how often you go, you’ll find something new that makes you go “wow, now THAT was really cool.” And that is exactly what happened to me recently and thus is the inspiration for this blog post. Last fall, Disney announced an all-new character meal at Wilderness Lodge (one of the fabulous on-property resorts at WDW) known as Storybook Dining, featuring Snow White, and two of the Seven Dwarfs – Dopey and Grumpy – along with the Queen, which was set to debut that December. 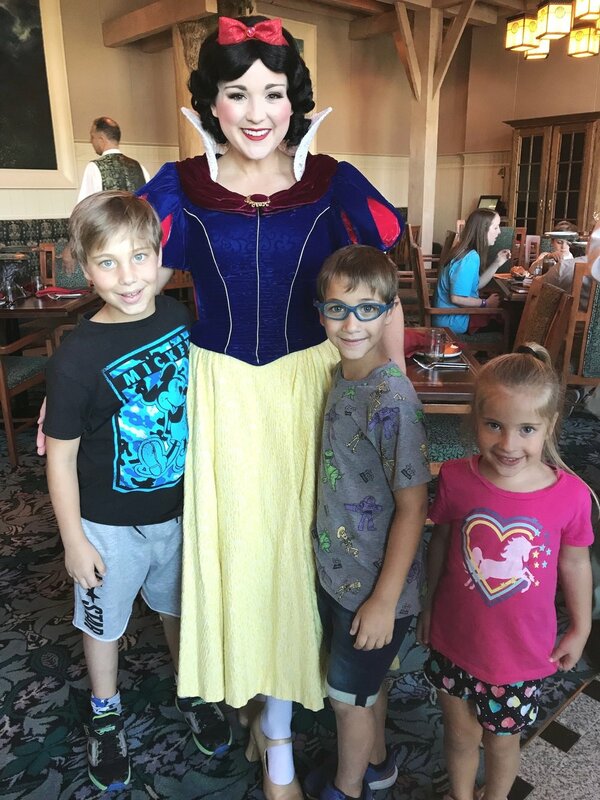 What stood out to me about this experience was that – while Snow White is quite easy to meet inside the parks and even at other character meals – Dopey, Grumpy, and the Queen are fairly elusive meet and greets, save for special ticketed events and other rare occurrences. So, I knew I had to book it. For those unaware, Disney allows you to make Advanced Dining Reservations (known as ADRs in some circles) 180 days in advance. And if you have tried to get some of the more popular ones, you know that your best bet is to be on the My Disney Experience app bright and early 180 days prior to your visit (or keep checking the app incessantly between days 179 and 1 and hope you get lucky – but that’s a blog for another day!). So, the day they became available – October 4 – I booked a reservation for March 2019 (not quite 180 days but since it was the first day reservations actually opened, I snagged one within a 5-month window). Whenever you book a dining reservation that far out, you hope the stars align enough to make it happen. Sure enough, in this particular case, they did. Kids had an off-week in baseball due to spring break and we decided to give it a shot, and – spoiler alert – I am glad we did! It stands among my favorite character meals to date and certainly my favorite “new” thing in quite a while. As mentioned, the dinner is located at Artist Point restaurant at Disney’s Wilderness Lodge, which makes perfect sense given the main setting of the classic 1937 film was the forest. So, there is certainly no better Disney resort for this dinner to take place. Upon arrival, you and your party are immediately transported to a different time and place. The one thing about Disney that I’ve talked about many times, is how they have truly mastered the art of escapism, enabling you to feel as though you are part of the fairy tale. And that is certainly true with this experience as you are whisked away to your table inside the Enchanted Forest and become part of the story. Dinner begins by enjoying shared appetizers that have – as your server will inform you – been personally chosen by Snow White herself and include: Winter Squash Bisque; Hunter’s Pie (Chicken, Black Truffle, Stone Fruit Preserve); and Wicked Shrimp Cocktail. Each of the three selections were memorable but the bisque was probably the highlight for me. Followed by appetizers you select one entrée from a choice of six (click here for the full menu). I went with the Magic Mirror Slow-braised Veal Shank (Celery Root Mashed, Wilted Winter Greens, Jus) and my wife went with the Royal Prime Rib Roast (Horseradish Mashed Potato, Hay-smoked Carrots, Popover, Jus). (There are also kids’ appetizers and entrée selections that my children enjoyed and can also be found on the above menu). And finally, The Hunter’s Gift to the Queen: Crackled Maple Popcorn, Ganache Heart – which was served in a dramatic presentation at the end of the meal. Once again, each of these treats were incredible – my favorite being the poison apple. It stands to reason, as good as the food may be, when you do a character meal, you are doing it mainly for the characters and in this case, they truly were the starts of the show. As mentioned, there are limited opportunities to meet the Seven Dwarfs. You can see them at Magic Kingdom daily in the Festival of Fantasy Parade, but your ability to meet them and get autographs, pictures, etc., is limited to special events like Mickey’s Not So Scary Halloween Party, which sometimes comes with hefty wait times. And while you don’t get to meet all seven here, I think they went with the right two to feature for this meal. Snow White is always a fun meet and greet but, as I stated above, there are ample other places to meet her (Epcot Germany for one). So, I have to say, the true star of the show here was the Queen. She was as true to character as any interaction I’ve experienced at Disney – intimidating, sharp and quick witted. This is the one meet and greet where you can get photo taken by Disney PhotoPass. At one point, my wife was a few seconds late for our family picture, and the Queen told my son, “why don’t you try teaching your mother some manners.” Ice cold and perfect. In all, it was well worth the wait (and the price) and an experience my family and I won’t soon forget – and we have some great photos to help us remember! This begs the question – where would you rank it among all the character meals at Disney? Well…you’ll have to read my next blog to find out! Until then, hope you enjoyed this trip into the Enchanted Forest for Storybook Dining. Matthew Papuchis is an award-winning corporate communications strategist and leader with global experience with some of the world's leading brands and most admired companies. Read more about Matt Papuchis here.